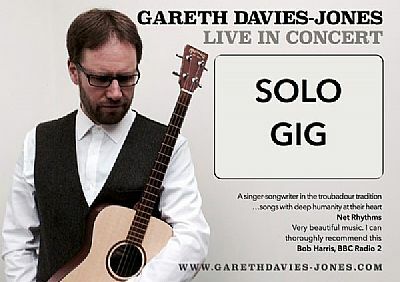 Highly regarded as a gifted / perceptive songwriter (BBC's Bob Harris, Iain Anderson are fans), Gareth's music is laced with a vivid and powerful sense of the aesthetic. A natural story teller, reviewers have placed his performances alongside the best in the Troubadour tradition. Combining elements of Guthrie, Dylan, Taylor and Browne, attention to musical detail is evident throughout his 7 solo & 3 collaborative albums. He plays a variety of instruments and features a keen sense of melody woven around a rich, distinctive voice. Raised on the shores of Belfast Lough, he now lives in the Tyne Valley. Gareth has been writing, singing and playing his own songs since his mid-teens. After studying at Newcastle University and cutting his musical teeth busking, playing in local bands and working, he turned professional in 2004 to begin a solo career which continues to gain momentum. Payment secures your booking which can be made either by PayPal, direct bank transfer (but let us know) or cash. We no longer issue physical tickets, a booking list will be held on the door on the night. You can send us an email for further information - NeashamRR@gmail.com or contact Lee on 01325 720205.